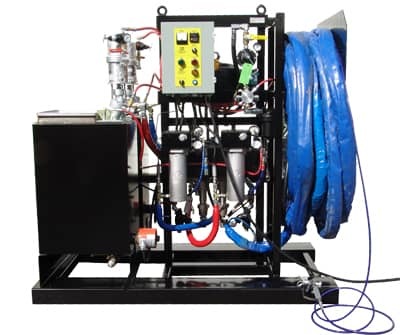 Corrosion Resistant & Protective Coating Spray Equipment | Spray Quip, Inc.
Spray Quip provides a variety of single and multiple component coating solutions & accesories from brands like Graco, Binks, WIWA, Wagner, etc. Whether fighting or attempting to prevent rust and corrosion, applying multiple-component coatings, or transferring liquids we can supply you with the protective coating equipment that will match your material needs. We build everything, from complete self-contained trailer systems to in-plant integrated systems with fixed ratio proportioning equipment to ensure the job is done properly with standard off-the-shelf components that are easily serviceable. 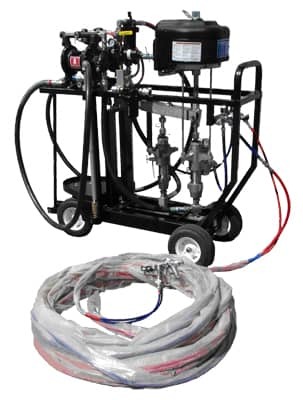 Spray Quip also inventories a complete line of parts, hoses, spray guns, tips and accessories. Our expert sales team can help you to determine the application requirements needed for your specific protective coating equipment and help you determine if you require applicators, pumps/spray packages, or a proportioners. Coating materials being used can also have an effect on the protective equipment needed. The specific tip size of the spray gun is dependant on the required flow rate of the materials being used. Each type of material can change the flow rate whether you are using Single & Plural Component Epoxy, Urethane, Hybrid and Vinyl Esther.